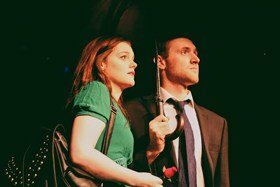 The play begins with a melancholy Henry (Andrew Skipper) standing at the side of the stage under an umbrella in the rain remembering an argument he has had with his wife, Emily (Isla Jeffery). He then arrives to what appears to be an empty house, unpacks his shopping and puts his meal in the microwave, once done he sits at a table and proceeds to read aloud The Times (his paper of choice for the day as it had a hedgehog on the front page!). We are then told the story of Henry’s relationship with Emily through a series of “flashback” scenes. The couple meet at a university party, their first date was a meal out (when they forgot to pay!). We also see an unfortunate Henry running into Emily on the morning of their wedding, followed by them settling into married life and awaiting the arrival of their daughter, Molly. It is after they become parents that life becomes a bit mundane for Emily and they bicker about where to send their daughter to school (an argument which was settled by the toss of a coin!). The final scene of them as a couple again has them bickering, ending with Emily saying she’s had enough before disappearing into the rainy night. Rain seems to feature a lot in this production. As well as the couple sheltering under an umbrella at a bus stop following their first date, Emily also has a line where she says about what may have happened to their lives had he not “sheltered them from the rain”. Also, The Tumbled Sea’s background music is very realistic in the way it gives the impression that it is raining outside. The set (by LB Carpentry and Joinery) is simple, albeit effective and comprises two small tables side by side. The actors sit at these tables whilst speaking into the audience and not directly at each other. Whilst this may sound a little odd, the actors manage to make this work and it really does appear that they are facing each other whilst they are speaking. I thoroughly enjoyed and recommend this “two header”; Andrew Skipper and Isla Jeffery, have good chemistry and work really well together, both give stellar performances as Henry and Emily performing their respective roles with subtlety and humour. The script is sparky, The story is bittersweet, thought-provoking and has a couple of laugh out loud moments with an excellent twist at the end. My only complaint is that at 45 minutes it was too short and it would have been great to find out what exactly had happened to Emily.